Every good soccer player needs to be able to look backwards and forwards at all times, knowing what is ahead of him and what is behind him when he receives a pass so that he can touch the ball away from physical defenders but toward himself and create for his team. Much of the beauty in a soccer match comes from these small plays, from the short passes and flicks between fast-moving players, from the subtle touch that–in the last moment before a titanic clash of boots and bodies–eases the ball away from conflict and into the sublime peace of open space—the moments of almost effortless calm between the storms and the arguments. Everyone present for one of these moments—be they players, fans in the stadium, or those watching on the television—stops everything and mentally takes a seat to enjoy and ponder the beauty of the play, the tranquility of the ball, rolling as a round buoy on a soft wave through the pitch. Forwards, backwards, behind, ahead, the touch by the left boot at the right time and a moment as good as a goal is born. Similarly, every good World Cup fan needs to be able to look backwards and forwards at all times, understanding that teams will survive and die off, players will perform and disappoint, and the appreciation of this sport isn’t really about scoring at all. Winning matters, but to the true soccer fan, it isn’t everything. If you support the United States men’s team and don’t believe me, think about how proud we are that our team doesn’t dive. In a recent New York Times article, U.S. midfielder and recent corner-kick-taking hero Graham Zusi said that diving “is something I’ve never really incorporated into my game, and I don’t plan on it.” Apparently, the U.S. team should dive more according to statistics and logic if they want to increase their chances of winning matches. But to come back to the point, and the opinion shared by many proud U.S. fans, winning isn’t always everything—we are Americans and we don’t dive. We know we can win without it. 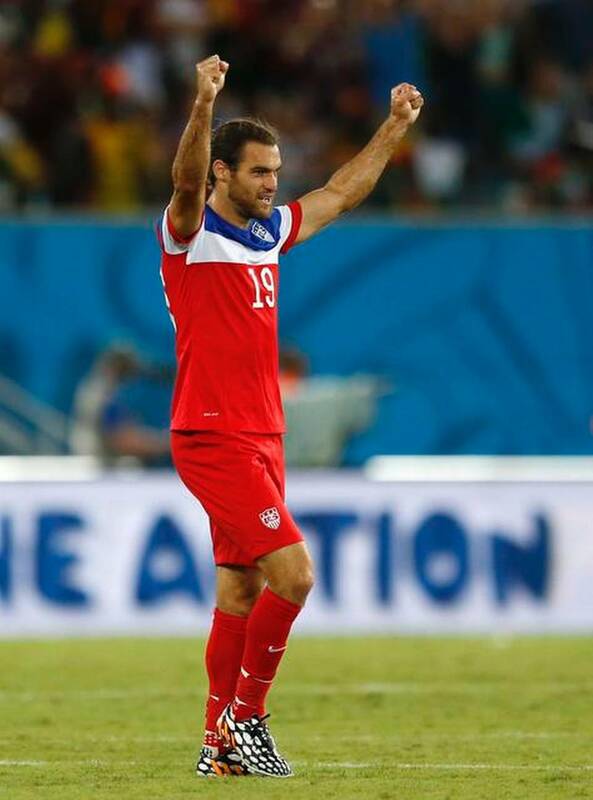 Graham Zusi celebrating his exquisite corner against Ghana. For most fans winning games and the tournament is crucially important, and it should be, but let’s remember that some of the best games and some of the most beautiful moments in the tournament will come long before the final in Rio and will involve teams that won’t be playing on the tournament’s last day. If we think about this week, there was the United States’ improbable last-gasp victory over Ghana and Mexico’s impressive and dramatic draw with mighty Brazil. The U.S. match had 81 scoreless minutes of game time between Clint Dempsey’s 1st minute brilliant run and André Ayew’s 82nd minute strike. The Mexico-Brazil match had no goals at all. And yet, these were arguably the best two matches so far of this 2014 World Cup, which has one of the highest first-round goal tallies in World Cup history. How were these two unbountiful matches the best of the young tournament, you may ask? It is because goals d0n’t make a soccer match. What makes a soccer match is: intensity, emotion on the field, evenness of play, the back and forth swings in momentum, and a plethora of those awe-inspiring, hope-igniting moments on the field. By these standards of soccer match excellence, the U.S.-Ghana and Mexic0-Brazil matches are unparalleled so far in their excellence with the Chile-Uruguay match the only other match in the conversation. Both U.S.-Ghana and Mexico-Brazil featured many phenomenal moments of exquisite soccer skill, brute force, players pushing themselves beyond their limits, and crowds experiencing frustration as well as ecstasy. These two Matches of the Week were also more exciting and interesting football contests than most you’ll see at this World Cup. Fans looking to extend the week’s soccer euphoria and witness more breathtaking touches and undoubtedly more beautiful goals as well, must tune in to tomorrow’s matchup between Spain and Chile. Spain is facing a must-win situation against a surging Chilean side that put in three goals against Australia in a match that showcased numerous dashes of brilliance from 25-year old midfielder Alexis Sánchez. Chile is surging with confidence, and this match feels a lot like yesterday’s main event between powerhouse Brazil and a Mexican team that is looking stronger every time they play. The only difference between that game and Wednesday’s big match is that Spain are fighting for their lives, and a loss for La Furia Roja (“The Red Fury”, Spain) against La Roja (“The Red One”, Chile) spells automatic elimination for the former and passage through for the latter. A draw for Spain would mean that they would have to beat Australia by 2 goals and hope that Chile lost to the Netherlands in the final games of the group. Because of how strong the Netherlands currently look and how weak Australia are, if either Chile or Spain can get an outright win in the game today, that team will likely advance in the group. Both squads have everything to play for and everything to lose. If Tuesday’s match is any kind of preview for Spain-Chile, fans are in for a treat, because Spain absolutely needs goals, and Chile are on a high. Sánchez recently told media that “Chile is going to win the World Cup. If I didn’t believe this, I’d have stayed at home watching the tournament on TV.” Regardless of whether Sánchez’s words represent cockiness or confidence, it makes for great football and must-see TV. Look for Spain to adopt a more direct approach in their attack with less beautiful passing in the middle of the park and more shots on goal. It should be a cracka! Alexis Sánchez celebrating his goal against Australia. Can Spain slow down the inspired phenom?